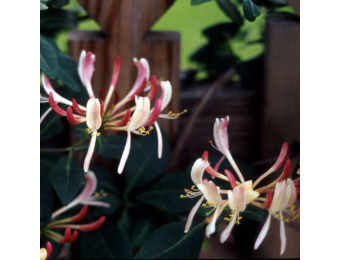 Late Dutch Honeysuckle has large clusters of fragrant purple-red tubular flowers with a soft pink throat. It will grow 15-18 feet. This vine blooms all summer long. The plant attracts bees, butterflies, and hummingbirds. This plant grows in Zones 4-8. Our vines are grown by the largest wholesale producer of clematis in North America. All vines are in 2.5-inch pots. These plants can’t be shipped to Arizona, California, Oregon or Washington. We can ship them when appropriate for planting in your zone. 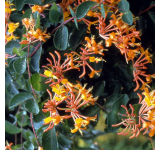 Planting Instructions: When selecting honeysuckle vines for your garden, think about mature height, flower, and color. 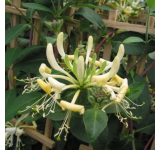 Plant your vine in moist, well-drained soil in a sunny location. Dig a hole and be very gentle when placing the plant in the hole as the roots, crown, and developing vines of the plant can be broken. Position the plant 1-2" below the soil surface, so the first set of leaves is just under the soil surface. Water the plant. Spread spiraling roots evenly throughout the soil. Keep evenly moist. Water the plant weekly to get the plant established.